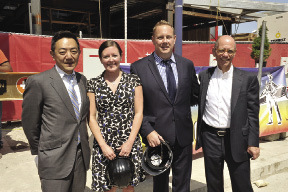 Shown (from left) are: Kelly Saito, president of Gerding Edlen; Heather Campisano, BRA chief of staff; Justin Krebs, Normandy Real Estate Partners and Mark Edlen, CEO of Gerding Edlen. Shown (from left) are: Youth Design member; Heather Campisano, BRA Chief of Staff; Justin Krebs, Normandy Real Estate Partners; Youth Design members; Kelly Saito, President of Gerding Edlen; Youth Design member and Mark Edlen, CEO of Gerding Edlen. Mayor Martin Walsh recently joined executives from Gerding Edlen, Normandy Real Estate Partners and National Real Estate Advisors in placing the final beam on the South End's new modern classic - Troy Boston. Located at 55 Traveler St., the $185 million mixed-use complex will provide new apartments, retail and restaurants with a host of modern-day amenities. Troy Boston, a 1.27 acre site, borders Traveler (which was once named Troy St.), Albany and East Berkeley Sts. The residential complex has been designed by the award winning architecture and design firm, ADD Inc. The sustainable property consists of two residential towers, offering 378 residential apartments with 38 affordable units on site. Suffolk Construction is serving as the construction management company, employing 589 construction tradespeople for the project. "The South End is such a vibrant part of our city, and this project is sure to enhance the area even further," said mayor Walsh. 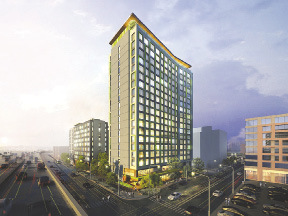 "Troy Boston is a great example of an innovative and sustainable development with onsite affordable units that will really help to activate this corner of the neighborhood. I'm also pleased that the team from Gerding Edlen, Normandy Real Estate Partners and Suffolk Construction is able to employ nearly 600 tradespeople on the project." One of the hallmarks of Troy Boston, designated as a LEED Gold building, is its internal power plant that co-generates electricity, hot water and heat, working at 25% better than current energy codes and saving its residents energy, water and clean air. Each apartment is meticulously designed, complete with 82% post-industrial, recycled content wood floors, stone countertops, custom closet space, energy saving washers and dryers, Nest Learning Thermostats and custom cabinetry in kitchen and bathrooms. The full city block, mixed-use complex features a 19-floor residential tower connected to a mid-rise tower. At the building's promontory corner on Traveler St., will be 6,000 s/f of retail and restaurant space. There will be an above-ground parking garage with 180 spaces. A spacious bike room that provides ample and easy storage, as well as bike repairs, is part of the building's appeal for residents. Pet lovers will rejoice at the top-of-the-line dog walking facilities and pet washing stations, both indoor and outside, to accommodate the city's climate. Cabanas that open out onto the outdoor pool and poolside deck provide spaces for relaxation. A rooftop terrace complete with fire pits and barbeques will be great gathering spots for residents. Inside, there is a chef's kitchen and large adjoining dining area for entertaining. There is a room outfitted with a billiards table, a private yoga room, and a fitness studio with cardio and resistance equipment. Additionally, comfortable lounge areas for relaxing, or just hanging out with friends, complete the new modern classic appeal of Troy Boston. Pivotal to the development team's ethos is Gerding Edlen's commitment to the local community of artists and designers. Troy Boston will feature commissioned pieces done by well-known artists and designers working and exhibiting in the South End. The topping off also featured a new community partnership with Youth Design - a non-profit organization headquartered in the South End that serves all urban youth in greater Boston to pursue a path to higher education and equitable careers by engaging the professional design community to mentor, educate, train and employ the next generation. Residents can walk to the SOWA gallery district, hip boutiques, as well as the Boston Center for the Arts, Huntington Theatre and the Calderwood Pavilion for the Arts. Some of Boston's finest South End restaurants and cafes are in walking distance and the unparalleled location connects Boston's most exciting neighborhoods - providing easy access to the South End, Back Bay, Chinatown and the Theater District. 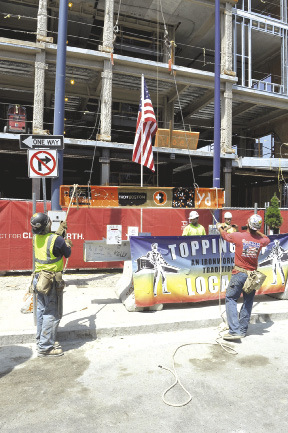 The topping off ceremony is a celebration steeped in history to honor the men and women who work on the project, mark a construction milestone, and celebrate the city's newest addition to modern city living. 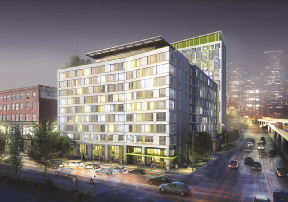 Pre-leasing will begin this month.